Brazil's president-elect, Jair Bolsonaro, joins Netanyahus in visit to Rio synagogue. Israel’s prime minister and Brazil’s president-elect attended together a historic ceremony at a synagogue in Rio. 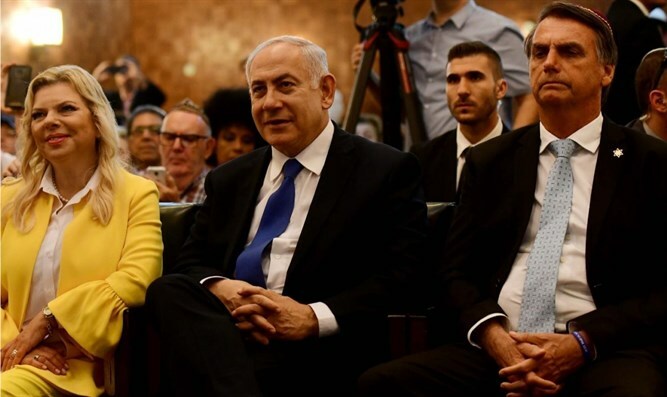 Some 500 members of the Jewish community on Friday afternoon warmly welcomed Binyamin Netanyahu, his wife Sara, and Jair Bolsonaro at the Kehilat Yaacov synagogue in the heart of Copacabana, Rio’s most heavily Jewish-populated neighborhood. “I am very moved and at this historic occasion I must ask you: ‘Tudo Bom’?” Netanyahu said in opening his speech, using the Portuguese expression that means “Everything is OK” and which was the name of one of the most popular songs last year in Israel. Rio was the starting point of Netanyahu’s five-day tour to Brazil, the first of a sitting Israeli prime minister to Latin America’s largest nation. He will be a guest of honor at Bolsonaro’s inauguration, to be held on Jan. 1 in the capital city, Brasilia. After he landed in Rio, Netanyahu headed straight to a meeting with Bolsonaro, followed by the visit to the synagogue in a much-awaited meeting with members of Rio’s 30,000-strong Jewish community. It was the first time Bolsonaro has entered a synagogue since being elected.